The Mount Tod hiking trail, with a side trip to Tod Lake up in the high alpine, was our Sun Peaks Hiking destination of choice at Sun Peaks Resort this summer. 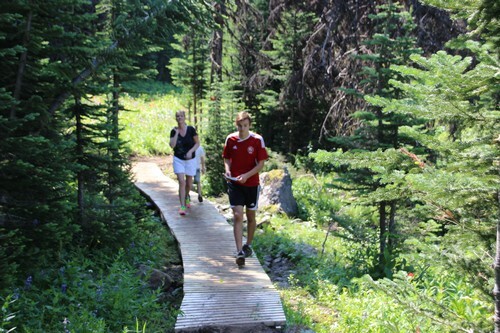 While it is hard to choose only one main Sun Peaks hiking trail each summer, with so many summer activities and too little time to enjoy them all, we thought we would tackle the ‘Advanced Trail’ this year. See the Sun Peaks Mount Tod hiking trail interactive map for more details. Save up to 40% on your lift-accessed hiking pass - buy online and in advance via the Liftopia link on the left of your screen. Our group consisted of an energetic 7 year old, a fit 16 year old, and us, a forty-ish mom and just turned 50 year old dad. But before we feel too good about enjoying and successfully completing the Mount Tod hike, we must mention that while we left well after the group participating in the annual “Reach the Peak” summit hike, we did catch up to them, including none other than Nancy Greene Raine and a fun group that ranged from 4 to 88 years old!! Allow between 3 to 4 hours for this hike (or longer if you care to enjoy the scenery longer or are not in a race against time like we were) that takes you up to the summit of Mount Tod (over 7,000 feet or 2,150 metres), across to Tod Lake, and then back through your choice of several routes including through the popular back country Gil’s gladed ski area. 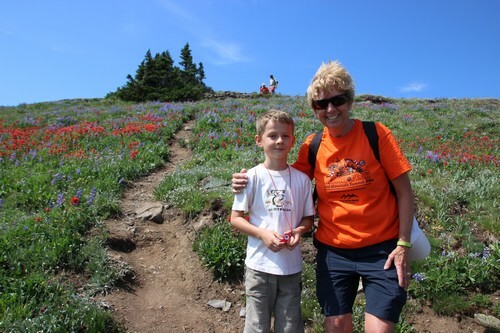 The Mount Tod hiking trail begins after purchasing your lift ticket and joining in with the other hikers and bikers who also take the Sunburst Express lift up to access the many popular downhill bike park or cross country mountain bike trails. The ride up is enjoyable and provides nice views and glimpses of downhill bikers as they race down the trails and over the jumps. Wildlife may also be seen while hiking, such as deer, fox, or perhaps even bears, so be prepared. From the Sun Peaks Hiking Trails map, we chose to follow the Vista Trail (multi-purpose (1)) to the West Bowl Trail (7) which also doubles for most of the way as the new ‘Altitude’ cross country bike trail. When we went up again in 2016, we took Gil's Trail up (#9) and then #7, 10, 5 and 2 down - makes for a great loop. You will pass through scenic sub-alpine forests (watch out for deer watching you! ), open meadows, bountiful and colorful wildflowers (in season mid-July to mid-August), across boardwalks over marshy areas and streams, and finally on to open areas with views of the Tod Mountain summit! There are some very welcome shady areas as well as wide open and beautiful sunny areas, so ensure you are properly prepared for the summer sun and heat. 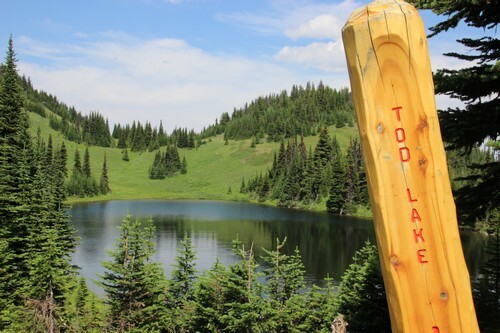 And then the choice is yours – detour left up to the spectacular summit along the short but fairly steep #11 Tod Peak Trail or carry on straight to scenic Tod Lake. Tod Lake is small but scenic, with nice photo opportunities as you round the corner and see the lake surrounded by trees and wildflowers. Be sure to stop and take pictures, simply enjoy the satisfaction of reaching the lake, or jump in chilly Tod Lake like our kids did. Once you are ready to head back to the chair (or adventurous enough to hike all the way to the village), there are a couple of options including backtracking to the West Ridge Trail (10) and down. However, the quickest and most popular trail back is Gil’s Trail (9) back to the mid-station and Sunburst Express chair to download back to the village for a well deserved pint or two! Altogether the Mount Tod hiking trail was our second favorite Sun Peaks hike so far, (first was the Juniper Ridge and Top of the World hike due to the beautiful village and Shuswap views and amazing fields of endless wildflowers) and is considered advanced, it wasn’t bad at all. 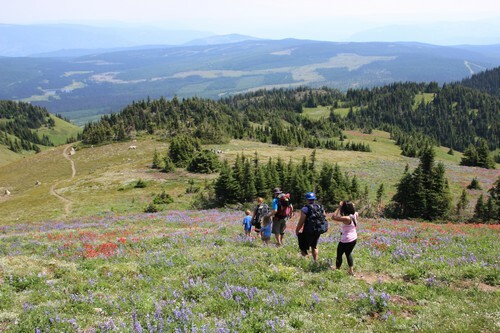 The Top of the World hike is also part of the full-day Sun Peaks Lake to Peak Adventure - check it out for an awesome day. It is around 11 km +/- round trip and has a total elevation gain of almost 3,000 feet (897 meters) but almost a thousand feet (300 meters) is courtesy of the Sunburst chairlift. 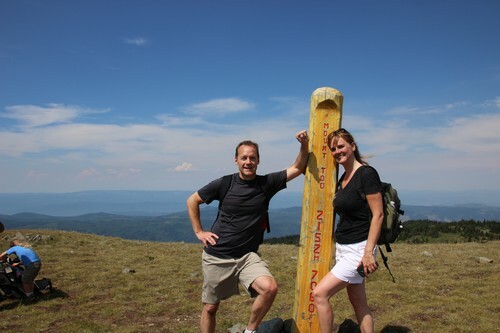 We all enjoyed the Tod Lake and Todd Mountain summit hike and are happy to recommend it to our Best Sun Peaks guests.